Tiffany: I have a soft spot for this tristich thing. Anyway, thank you. Q2 : What is the first thing you want to do when you come to Korea? 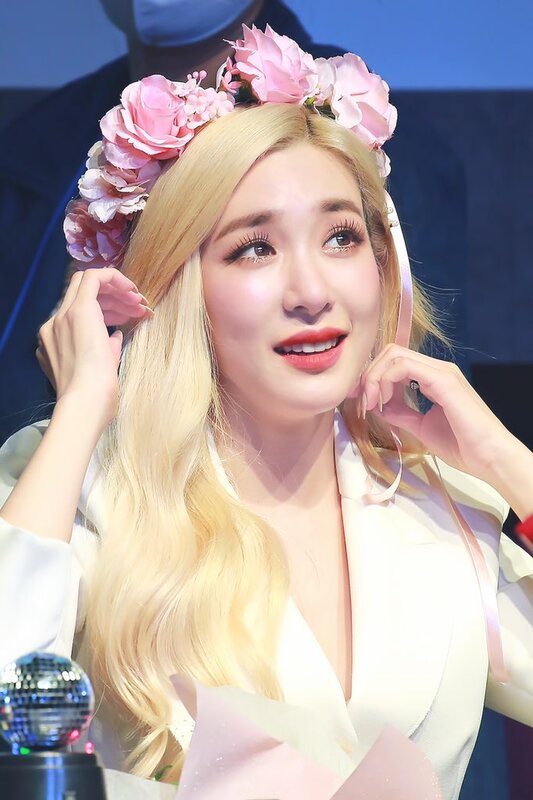 Tiffany : "Of course it's meeting you guys. I did rehearsal right after I arrived. I wanted to show my best self to you. And next is, meeting SNSD members? We met yesterday and planning to meet again tomorrow." Fans asked Tiffany to do IG Live when she meets SNSD members. Q3 : What pushed you to dye your hair with blonde? Tiffany : I wanted to do the thing I've never done before. I wanted to break the mold of myself, musically and physically. Q4 : Have you ever missed Korea after you're back to the States? Tiffany : A lot. When I want to eat tteok-bokki. (fans laughed) It's a joke. (laugh) I made a decision and went back to US, but after 6 weeks, I really missed Korea. Even when I wrote songs, I always thought about it. I never stopped thinking about you even for a second. Q5 : What do you think when you hear you're a songwriting genius? Tiffany : Thanks for the compliment. Though I'm not a genius, thank you for loving my songs. I think it's only a beginning. I'm enjoying it, and it's becoming easier for me to send a message I want. The best part is, I used to listen to the music when even myself don't know how I feel. I hope my songs to be such thing for someone. I will try to be a real songwriting genius. Tiffany : I'm planning on doing it within this summer. I wanted to break it to you in Korea first. Please come and see me. Q8 : What is the hobby you recently get into? Tiffany : It's more like a specialty than hobby, but (fans laughed) yeah, I think you already know it. I realized I can peel a banana with my toes. Maybe it's because I did ballet or danced with heels on. Some fans recommended me cooking, but I'm the person who turns cooking into variety. (fans laughed) In fact, the video which I did cooking will be released soon. I hope you enjoy it. Q9 : What is the words you heard recently which gave you strength? 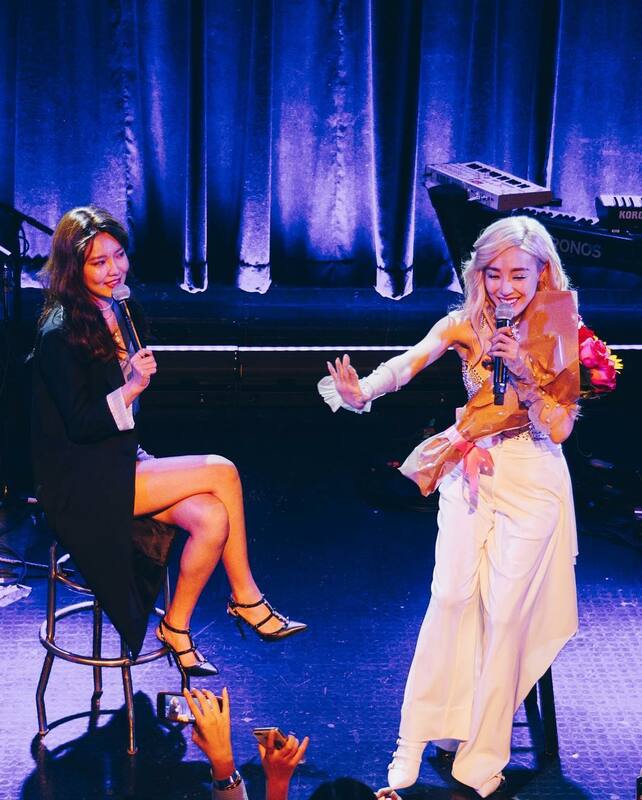 Tiffany : Sooyoung came to see my last concert in NA tour. I asked her opinion if there's anything I can fix. She said 'I think showing yourself without filtering is cool and beautiful. That one gave me a lot of strength. Since this tour is solely about myself, I really wanted to hear such words. Q9 : คำที่คุณเพิ่งจะได้ยินเมื่อเร็วๆ นี้แล้วทำให้คุณมีพลัง (กำลังใจ) คืออะไร? Q10 : What is your recent movie recommendation sans Sooyoung's? Tiffany : Sooyoung did a great job in the movie, btw. It depends on genre. (fans shouted horror, romance, etc.) For horror film, did you watch 'It'? It was great in many regards. Q11 : Which person did you call first before you came to Korea? Tiffany : After the last concert, I was upbeat so I drank some alcohol. Sooyoung came to my room and helped erasing my makeups. At that time, I called every single members. (laugh) So it's not really a single person. I called every member in about 20 minutes. Q12 : Which song would you like to sing if all 8 members are together? Tiffany : Which song do you want to hear? (fans said Sailing) Sailing? Great, let's sing it together. You guys are too shy! (laugh) To me, of course ITNW and yes, Sailing is good, too. But my personal favorite is Light Up the Sky. I listen to it a lot before I go to bed. It reminds me of the memories we made together. Q12 : เพลงไหนที่คุณอยากจะร้องเพลงถ้าสมาชิกทั้ง 8 คนอยู่ด้วยกัน? Q13 : For Tiffany who is 29, what is the thing you want to achieve in your 30's? Tiffany : Thanks for counting my age in American way. (laugh) I've had a dream-like moments as a SNSD. We became strength for girls and boys. Being 30, I want to be a woman, an artist, who put all my heart and effort in, work hard forever, and prove myself with time. I promise you that I will make more good memories with you in my 30's fearlessly. Thank you for asking me this question. Q13 : สำหรับทิฟฟานี่วัย 29 ปี อะไรเป็นสิ่งที่คุณต้องการทำให้สำเร็จในวัย 30 ปีของคุณ? Tiffany : Thank you for being here for me. I'll try to make an event like this more frequently. And also, I will prepare hard for Asia Tour. Please wait for me. Thank you.